In early 2017, we directed your attention to a new IPO investing platform called ClickIPO. 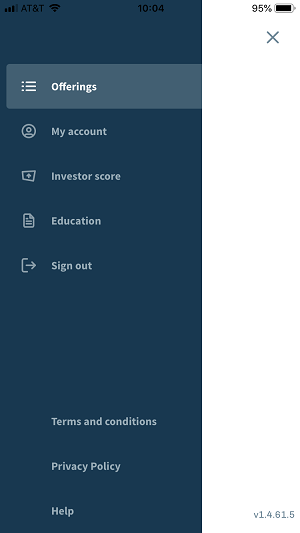 ClickIPO is a smartphone app that connects to your existing brokerage account to give you access to IPO and secondary offerings. Many of you signed up for the waiting list and downloaded the app for your smartphone when it was ready. It’s now available to all investors. You can use the app to research deals and invest if you have an account with a partnering broker. 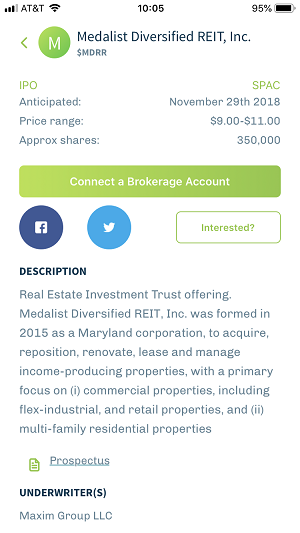 Right now, only one partnering online brokerage is available… TradeStation. Many of us, including myself, have not invested through the app yet because our brokers have not become partners. However, I’ve been told by ClickIPO that other brokers are in the pipeline and should be brought online in the coming months. But no specifics have been given about which ones other than some of them being well known firms. Based upon data taken from the app and the deals that were able to be purchased through their platform, ClickIPO participated in 30 deals in 2018, which is pretty significant. While the market has been notably down the past several weeks, there are still some well-performing IPOs as well as plenty of dogs that have floundered. Similar to the market as a whole and especially in light of the current market pull-back and volatility, many of the offerings have not fared well since their IPO came out. With that said – just as you would research and selectively make your investment decisions, doing your due diligence and learning about these companies before investing in an IPO or secondary is essential. If you haven’t tried the app yet, I encourage you to download it and check it out. At a minimum, it’s great for researching IPOs and secondaries. 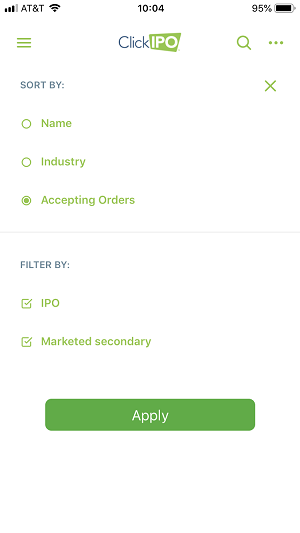 You can filter by IPO or secondary, and sort the list to show deals that are available through the platform on top. This first screenshot below is the Offering view showing current offerings. I have this sorted by Accepting Orders, the deals available on the platform. The two deals at the top are what’s available (at the time of taking these shots). The following deals are available for research. You can tap the Interested? button to put a deal on your radar. Click the menu accordion at the top left to get the menu view. 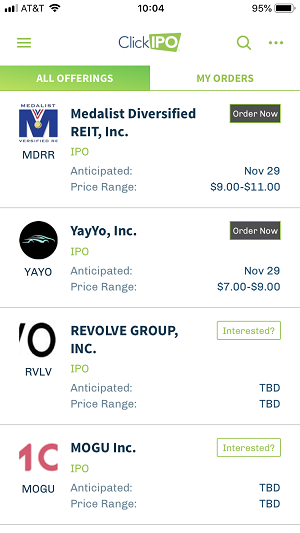 From the home page, tap the three dots on the top right to sort and filter the IPOs and secondaries. Finally, when you tap on a deal, you get the details including name, symbol, anticipated date, price range, and an approximate number of shares for the offering. From this view, you can invest or mark as interested to keep it on your radar. Most importantly, there’s a link to the offering prospectus. When you tap it, you can read it directly through the app or email it to yourself. Now that investors have more access to IPOs via platforms such as ClickIPO and Motif, we’re realizing that most of the deals are not as exciting as the high profile deals like LendingClub or Snap. However, IPOs work similar to regular stocks and are relative to risk and return. No surprise there, because those high-profile deals only come around a few times a year. As evidenced by those two deals, we also realize that not all successful IPOs continue to thrive. What I really like about ClickIPO is the simplicity and ease of use of their app, as well as their proprietary Investor Score, which is a way to measure your quality as an IPO investor. When they start getting more access to deals, investors with a higher score will get preference for a better allocation on IPOs over others. That means you’ll need to invest for longer holding periods of at least 30 days, as well as participate in some of the lower-profile deals to build your score in hopes of getting access to the next big deal. At this point, we don’t know how likely it is that ClickIPO will be allocated shares in bigger deals, however, they have established relationships with over 20 major underwriters now. I believe as they grow their partnering brokers list and grow their customer base, they’ll be able to get access to more deals with larger allocations. This task must be difficult to test and finalize as we’ve only seen one broker available so far, however, expect more to be added soon. Check back here for updates when new brokers are added to the ClickIPO platform.